Adore Beauty is an official stockist of The Beauty Chef. Buy now, pay later with Afterpay. Carla Oates - a best-selling naturalist author and ambassador to Australian Organic - has created a unique beauty range that utilises natural ingredients for a more beautiful you, inside and out. Based in Sydney&apos;s Bondi Beach, Carla has been writing, researching and teaching organic health and beauty for fifteen years. Her journey began as a result of her own skin challenges, realising at a young age that lacto-fermented foods could have a remarkable impact on improving eczema, allergies and rosacea. When her daughter began experiencing similar skin issues, Carla’s interest in the area of gut and skin health intensified and she was motivated to create natural products that would help to relieve these conditions and create a healthier skin from the inside, out. Carla identified that one of the critical keys to good health is filling the gut with lots of good bacteria. This important bacterium can be readily found in fermented foods. The process of fermentation biologically enhances ingredients and increases their nutritional value. It also increases nutrient absorption to ensure that you are ingesting all the vitamins your body needs. Carla knows that the nutrients in our bodies go to the main organs first, sometimes leaving the skin, hair and nails to go without. This is why many people see benefits in their skin, as well as experiencing faster nail and hair growth when using The Beauty Chef products. 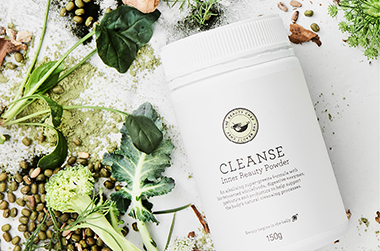 The Beauty Chef range is based on fifteen years of research and experimentation as well as collaboration with Australia’s best natural health practitioners and formulators. Carla understands the value of natural ingredients so her products use certified Organic, Biodynamic, local and fair trade ingredients wherever possible. Making The Beauty Chef part of your daily routine will help to create healthy, radiant skin that glows from the inside, out. Showing 7 products of 7. This is a super yummy vegan protein powder which is ideal for starting the day. It has replaced my morning coffee. The ratio to calories vs protein is ideal also. It really does give you an energy boost and you notice it on days you don&apos;t have it. It has cacao in it so the chocolate flavour is real and taste good not that fake weird chocolate flavour. Being a vegan plant based protein it can be hard to get a smooth mix. I usually have it with either a tall glass to hot warm almond milk so it mixes eaiser or blend it with a banana and almond milk. It&apos;s a really nice way to start the day and an easy way to get in a decent amount of protein. I have been using this for the past month and I have just started to see a difference. I started on it for bloating which I have noticed a difference with but also for that &apos;glow&apos; it promises which it does deliver on. Definite improvement in gut health! I was given a pack with this and the Glow powder as a gift late last year. Even though it was a smaller size and only about two weeks worth I noticed my gut and digestive health improved whilst taking the two. I haven&apos;t taken this by itself so am unsure as to how much of the positive effects were from the Collagen Inner Beauty Boost or from the Glow powder. However, I was so impressed that I am gearing up to buy the full sized items to continue using for a happy belly! I&apos;ll add that my belly is very sensitive and easily upset so anything that helps is amazing and rare! I&apos;d definitely give it a go if you also suffer from belly troubles.